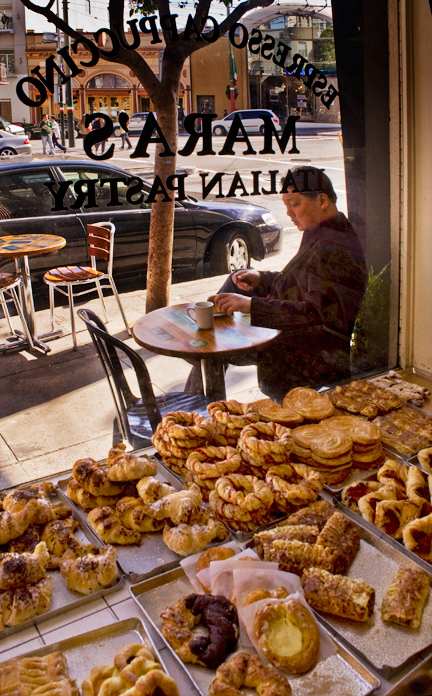 Where would you rather be on a Saturday morning than on a sidewalk cafe table in North Beach? Early on, the Bay Area was nicknamed "New World Italy" due to the similarity in its temperate climate, golden hills, and rich soil. The city attracted many immigrants from northwestern Italy. The first to settle in San Francisco were traders from the port city of Genoa followed by others from Tuscany. As a culturally-strong community, the Italians tended to remain to themselves rather than assimilate into the rest of San Francisco society. Although united by a common language, the immigrant Italians here were actually divided into distinct regional and often rival groups. The rural Ligurians turned to farming, implementing widespread irrigation. They were responsible for turning much of San Francisco's sandy land into lush and fertile gardens of spinach, cauliflower, broccoli, fava beans, radishes and artichokes. The business-minded Tuscans ran the fruit and vegetable markets as well as boarding houses and stables. The coastal Genoese and Sicilians operated the city's fishing fleets. By the early 1900s the Italian community was so well established in North Beach that city renamed the district's 80-foot wide boulevard from Montgomery Avenue to Columbus Avenue, recognizing and honoring the Italian community. However, up until the 1940s most residents of North Beach still only spoke Italian. It wasn't until Mussolini's fascist aggression during World War II that the Italian community broke its self-imposed isolation and embraced a more American identity.